At Christian HELP, our mission is to prevent homelessness by helping people find jobs, while providing for them spiritually and materially. According to the most recent ALICE Report, a study from United Way, 47% of our population is one crisis away from homelessness—whether it’s a medical emergency, their car breaks down, or they suddenly lose their job. We teach clients the skills they need to not only find a job, but find their fit. We also provide food from our pantry to offset grocery costs while they search for work, so that they’re able to pay their rent, electric bill, etc. One of our other provisions is prayer. Throughout their employment journey, clients meet 1-on-1 with a Care Manager. This Care Manager teaches them the skills they need to find and keep work, but more importantly, they pray with them should the client desire this. This little piece goes a long way for people who are feeling helpless about their employment situation and circumstances in life. Your dollars are crucial to our work, as we receive no federal funding, and are dependent on the community’s support. With that in mind, thanks to some wonderful donors, your gifts are now being DOUBLED through Spring Match! Until May 1st, your donations will be matched up to $40,000! What Impact Can Your Donation Make? With so many people on the brink of homelessness, now is the time to give and have your impact DOUBLED! For every $120 donation made to Christian HELP, 1 person can be connected to employment and receive 2 weeks’ worth of groceries from our pantry. By having your donation doubled through this Spring Match campaign, that $120 becomes $240! Now you will provide for 2 families! 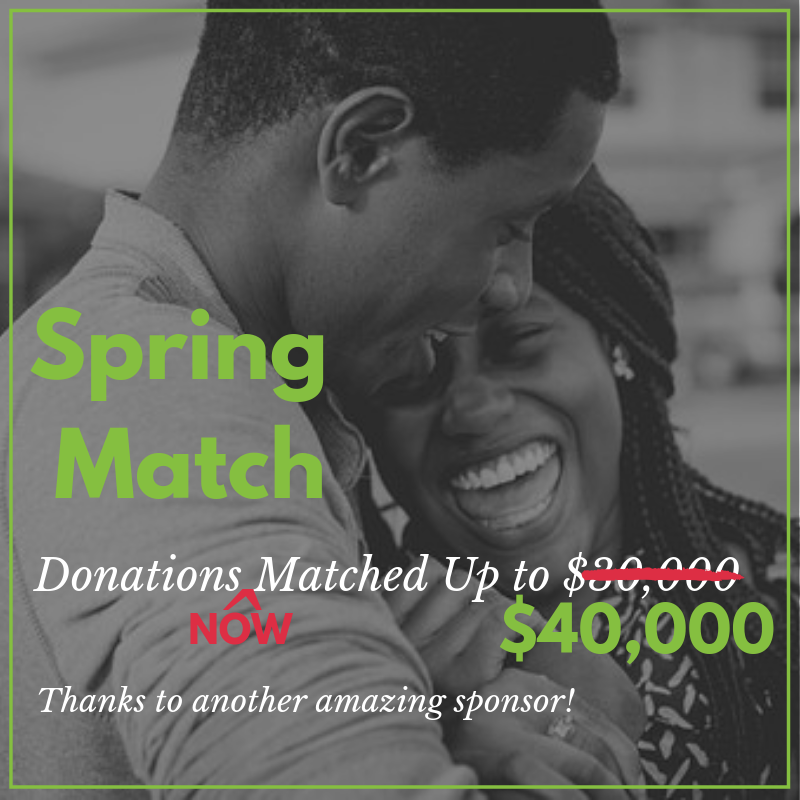 The best part about Spring Match, is that if you donate through your company’s match program, then your gift is TRIPLED! Because when you give, your company gives, and then the donors match it! If you want to prevent homelessness, April is the month for you to donate and impact your community in Central Florida 2 or 3 times over. “I came to Christian HELP with lots of anger at past employers. I was able to work through that by talking with my Care Manager. After lots of prayer, we updated my resume and practiced interviews…Once I started putting into practice the skills my Care Manager helped me work on, I started applying for the positions I wanted. After a short time, I went from unemployed to multiple job offers!” – N.V.
“I was unemployed and found Christian HELP from an internet search. I have over 10 years’ professional experience as an Office Assistant/Coordinator and a Bachelor's degree. But still, I needed an updated resume and encouragement because I lacked self-confidence and could not properly interview. After training, I actively applied and sought full time employment with a positive attitude. After one month, I found full time employment with benefits! 'I'm so thankful to Christian HELP. When I get my first pay check, I will be donating some of it to Christian HELP!” – K.W. Support Christian HELP Through Your Employee Giving Program!